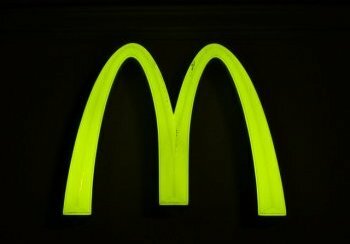 A Denver man chained himself to a McDonald's drive-thru ordering speaker around six-o'clock last night in protest of the past discontinuation of the Szechuan dipping sauce. Kyle Rollins, 24, claimed he'd just been waiting "too damn long" for the episode to come out. He said he felt compelled to do something to convince the fast food chain to reproduce the sauce so his show may go on. "His hair was green and he was screaming something about his favorite show not airing a new episode until Mickey D's brought back some kind of teriyaki sauce," said one witness who was in line, waiting for their 4-year old's super-sized triple cheeseburger meal. "I mean, the drive through is slow all the time but cars were just backed up with people taking selfies with this guy." The sauce was apparently created as a limited edition back in 1998 as a promotion for Disney's movie Mulan. In a recent episode of the hit show Rick and Morty, one of the main characters, Grandpa Rick, brought the sauce to light again in a major way when he demanded he "wants that schezuan sauce." Employees weren't allowed to comment on whether or not the incident would have any effect on the chain's dipping sauces, and management was in the back somewhere "getting super high." Super! A masterpiece. I thought it was funny. WHTEVER YOU SAY, FRECKLES. WHATEVER. NICE WORK, FUNNY TYPE PERSON. HEH-HEH.